A beautiful Spring here in Georgia. We are busy with many projects. We are trying not to listen to the news. It's not that I think we should put our heads in the sand, just the opposite, we should keep our eyes open and our heads up and work like mad. The dumb walls will fall and the creative among us must be ready with ideas and solutions and programs. 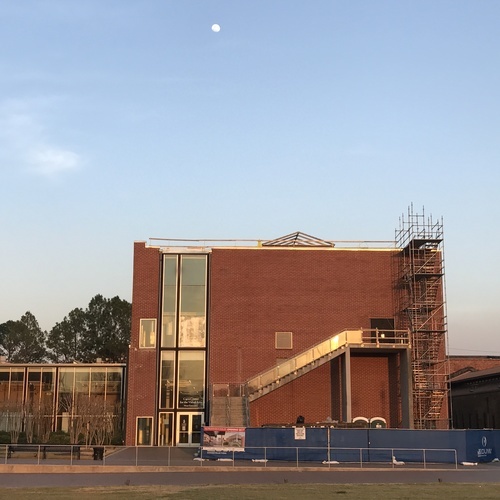 The Bo Bartlett Center is under construction. It will be completed by the Summer and will be scheduling an opening by the end of the year. Pretty exciting. Many years of hard work and community cooperation to bring it to reality. Thanks go out to everyone who has played a part large and small. Our mission is just beginning. I believe in the power of Art to transform lives. The "Home Is Where The Art Is" exhibition, to benefit the participants in the homeless arts program, is coming up next month at the Columbus Museum. We are gearing up to shoot our first feature film... in Georgia in June. Exhilarating. The learning curve is steep but everyday brings new opportunity. We are putting together a solid team of film folk, both experienced and newbies.. involving the whole community, it is a home grown project. It is Ultra Ultra Low Budget. If you are in Georgia and are interested in helping in any way, please reach out to Marina ( assist@BoBartlett.com ). We can use all the help we can get! The solo show at the Mennello Museum and the companion exhibition at the Orlando Museum continue into May. If you are in Florida please visit. There is a Summer show coming up at Dowling Walsh Gallery in Rockland Maine. If all things are taken into account.. we are still doing ok. Everything is relative. Keep your head up. Stand sure. Life is good.. Live it fully!